Join the discussion on our forums! 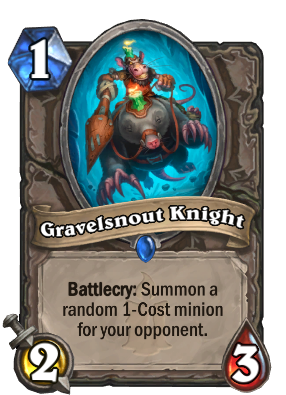 Come discuss Gravelsnout Knight over in our dedicated Gravelsnout Knight discussion topic. The mole of La Mancha rides again! The only real use for this card is as a Big priest counter in wild. The only good thing about this card is its quotes. FOR CANDEL! Honestly would be better if it was a 10/10 with stealth that filled the enemies board with 2-cost minions. - Unlicensed Apothecary ---> Treachery -----> 2 Gravelsnout Knight . Maybe? I don't believe they were able to copy Zombie Chow succes here with this one. Hungry Dragon wasn't played for 4 mana and good stats with the same effect. I wonder if this would be. I mean, there are some good 1 drops in standard right now. My guess is maybe not. I imagine we're going to see a lot of Trolden videos of naive players playing this piece of trash on turn 1 and summoning a Dust Devil for their flabbergasted opponent. This, dire mole and feral gibberer could potentially make quest hunter decent. "Ah! It's my evil twin brother, always trying to take my candle."